Durham-Orange Light Rail Transit project is a proposed light rail line between southwest Chapel Hill and east Durham. Image: courtesy of GoTriangle. The LRT will cover a stretch of 17 miles (27.35km) and will have 17 stations. Image: courtesy of GoTriangle. Travel time between UNC Hospitals and Alston Avenue will be considerably reduced by the new light rail project. Image: courtesy of GoTriangle. The estimated cost of the Durham-Orange LRT project is $1.8bn. Image: courtesy of GoTriangle. Durham-Orange Light Rail Transit project is a proposed light rail line extending from southwest Chapel Hill to east Durham. It will connect educational, medical, employment and other activity centres along with the Durham Amtrak Station and Durham Station. The Durham-Orange corridor, which houses important institutions such as the University of North Carolina at Chapel Hill (UNC), Duke University and North Carolina Central University, was identified as a high-priority transit corridor in the 1990s. It is one of the only two light rail projects in the US to receive approval from the US Department of Transportation in 2014. The project is expected to ease congestion, and accommodate an average of between 20,000 and 25,000 weekday riders by 2040. The project is being developed by Triangle Transit and entered the development phase after receiving the approval from Federal Transit Administration in 2014. It is expected to enter the engineering phase in spring 2016 and complete all related activities in 2019. Construction is expected to begin in 2019 and will be completed by 2025. "Construction is expected to begin in 2019 and will be completed by 2025." The proposed project includes a 17 mile long (27.35km) light rail transit line with 17 stations, 3,900 parking spaces and a maintenance facility. It is planned to cover the stretch between UNC Hospitals and East Durham via the Friday Center, the I-40 corridor, Patterson Place and South Square areas, Duke Medical Center and downtown Durham. Scheduled to operate through the week, the LRT will run at a frequency of ten minutes during peak hours and is estimated to reduce travel time between UNC Hospitals and Alston Avenue to 42 minutes. The light rail will be built with two sets of tracks each direction and will include up to 30 elevated light rail crossings over existing roadways. Farrington Road has been selected to construct a rail operations and maintenance yard spanning more than 25 acres (10ha). A total of 12 LRT vehicles are planned to traverse the proposed route. The light rail vehicles will be of low-floor and powered by electricity supplied from an overhead catenary system. Running on dedicated tracks, the vehicles will operate at an average speed between 20mph and 35mph. Traction power substations are also required to be constructed at every one mile interval along the light rail line to alter the electrical current to a suitable level required for powering light rail vehicles. The vehicles will have tamper-resistant equipment, communication networks, CCTV monitoring, intrusion alarm systems, and relevant fire, life, and safety requirements. The light rail extension will serve the north-east corridor, spanning from the city centre to the University of North Carolina (UNC) campus, Charlotte. The estimated cost of the project is $1.8bn, while $17.9m a year will be required for operation and maintenance. Part of the cost will be funded from a combination of sources that include sales tax revenue generated in the Durham and Orange counties, funding from North Carolina Department of Transportation (NCDOT), and other local fees and taxes. Durham and Orange counties have initiated the levying of one-half cent sales tax for aiding the project. The project received a grant of $1.7m from federal authorities. In addition, the project is expected to receive Transportation Infrastructure Finance and Innovation Act (TIFIA) credit assistance and New Starts federal funding. Core benefits expected from the project are a high-capacity transit service, improved mobility and increased connectivity. The design for the new transit rail also includes plans for new pedestrian and bicycle infrastructure in station areas. An additional eight new park and ride lots will be built along the line with car parking for approximately 5,000 vehicles. Construction of the proposed project is estimated to generate up to 2,800 direct and indirect jobs a year over a period of five years. The project is planned in partnership with Federal Transit Administration, NC Department of Transportation, Durham-Chapel Hill-Carborro Metropolitan Planning Organization, Durham County, Orange County, City of Durham and Town of Chapel Hill. 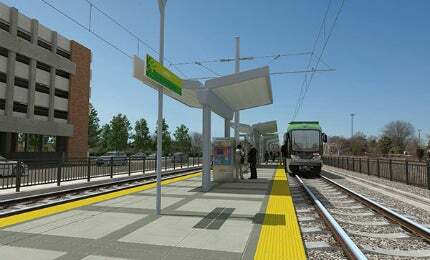 URS has been selected to provide project management services for the LRT project. Neighboring Concepts are the architects for the project and are responsible for designing the vertical transit structures that include stations, parking structures, pedestrian bridges and other vertical facilities.